Lake ice forms due to cooling and freezing from above, driven by radiative and sensible heat losses to the atmosphere in the autumn and winter. The surface energy balance described in chapter 3 is applicable here. Snow falling in open water can provide an additional energy sink, due to the latent energy removed from the lake to melt the snow. If temperatures reach 4°C as a lake cools, the density maximum of water at this temperature (see figure 2.2) results in curious behavior. Dense surface waters will sink, creating a systematic fall cycle of "flushing." Overturning in the water column brings warmer water to the surface, where it will cool as the flushing process continues. There can be several flushing events in a lake each autumn, until much of the water column has a temperature near 4°c. continued cooling creates stably stratified surface waters that will begin to freeze. once ice is nucleated, conductive heat loss to the atmosphere promotes ice growth. Growth rates are sensitive to the depth (insulating capacity) of local snow cover and the temperature gradient, hence the air temperature. This is illustrated below. Ice cover is intermittent in regions where winter temperatures fluctuate about 0°c. cold spells (sustained temperatures of less than 0°C over a period of several days) set up a tenuous layer of ice that is millimeters to centimeters thick. Thin ice cover has little thermal inertia, so a brief (e.g., 1- or 2-day) warming episode can melt the ice. Such freeze-thaw cycles characterize many lakes all winter long. If temperatures remain subzero for long enough to form a thicker ice cover, however, it requires a large amount of latent heat energy to melt the ice. Winter nights are long at high latitudes and are characterized by a net energy deficit (primarily longwave cooling), so ice thickens overnight, and there are limited daylight hours to drive melting in midwinter. This makes a well-established lake ice cover quite endurable, such that it is able to weather multiday warm spells, and it will typically persist through to spring. Freezing of lake water creates congelation ice, which is commonly called black ice. This is not to be confused with the "black ice" that forms on roadways when re-frozen water forms a thin, transparent veneer of ice, making it treacherous for driving. Black ice in lakes is characterized by ordered, vertically aligned ice columns, a result of slow crystal growth driven by vertical heat diffusion (conductive heat losses upward into the overlying ice). Black ice is an ironic name; it has relatively few air bubbles, making it highly transparent to light. Hence, it is possible to see right through this ice into the underlying water, which is dark, giving the ice its black appearance. In contrast, ice that forms from above due to flooding of snow-covered ice is called slush ice, snow ice, or white ice. Its high bubble content promotes strong backscatter of light and an opaque white color. White ice has small, randomly ordered ice crystals. As noted in the earlier section "Snow-Melt Models," flooding can occur if snow on the ice is thick enough to cause ice to sink below the waterline. Snow-ice can also form from saturation and freezing of snow cover due to lake water that is pushed up through fissures or cryoconite holes in the lake ice cover. Such fissures may be a result of contraction cracks that form on cold nights. Flooding can also be caused by groundwater flows or streams that feed a lake, where such water flows are dammed or diverted to flow on the surface of the ice cover. Icing from this effect is also called naled or aufeis, literally "ice on top." Ice does not completely cover lakes in many cases, particularly in the early stages of freeze-up, as wave action and the motion of water in inlet or outlet streams prevent ice from setting up. Because of the greater wave energy in the middle of a large water body, lakes often freeze over from the edges, radially inwards. Lake ice cover is surprisingly strong in its ability to support a load. A consistent 5- to 10-cm ice cover is enough to support a person on foot (e.g., skating or ice fishing), 12-15 cm permits snowmobile travel, 20 cm can support a light automobile, and more than 50 cm enables heavy truck transport. These are general rules of thumb, and things such as underlying water currents or fractures in the ice can compromise its strength. Different jurisdictions provide different guidelines for winter ice travel. In Finland, for instance, ice roads used for light vehicle transport must have an ice thickness of at least 40 cm across the entire expanse of the road before they are opened for the season. Ice growth proceeds quickly during early stages of freeze-up but is then self-limiting due to insulation of the basal ice-water interface from cold atmospheric temperatures. In a single growth season, this thermodynamic limitation gives maximum ice thicknesses of 1.5 to 2 m in extremely cold environments (i.e., polar regions). Snow cover has a strong additional insulating effect, further limiting ice thickness. Where seasonal ice roads are important for transportation, engineering is often done to stimulate thicker ice artificially. The two most effective tactics for this are to clear the snow cover and to spread water on the ice, introducing ice accretion from above. Similar techniques are used in building and maintaining backyard skating rinks. 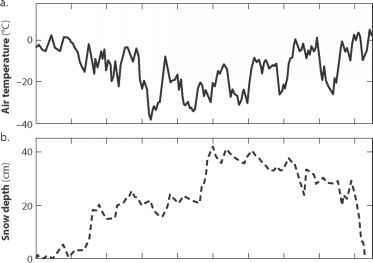 + k i equal to the heat flux from the water, Qw, and Qout is the heat conducted upward into the ice. The symbols b- and b+ denote the infinitesimal layer below and above the base of the ice. The upward-directed heat flux is a function of the air temperature and the thickness and thermal conductivity of the overlying ice and snow. When combined with Eq. (3.5) and using a moving (adaptive) grid in a numerical scheme that tracks the phase front, the model introduced in chapter 3 can be applied to simulate ice growth subject to air temperature forcing. Figure 4.2 plots an example for an idealized case with Qw = 0.5 W m 2 and meteorological forcing based on observed air temperatures and snow depths in Yellowknife, northern Canada (62.46° N, 114.44° W). The solid line in figure 4.2c is for a hypothetical case with pure ice (no snow cover), and the dashed line includes a variable snow cover based on the Yellowknife meteorological data, assuming a snow density of 300 kg m-3. I use temperature- and density-dependent values for the heat capacity and thermal conductivity of snow and ice as given in chapter 3. Figure 4.2. Modeled lake ice growth through a winter season, based on daily air temperatures and snow cover in Yellowknife, Northwest Territory, Canada, from winter 2009-2010. (a) Air temperature and (b) snow cover forcing used for this scenario, October 7, 2009, to April 25, 2010. (c) Lake ice thickness for snow-free conditions (solid line) and including the effects of the snow cover (dashed line). ice, especially if it remains cold and dry; water-saturated snow is more conductive. The effective insulation is also very sensitive to snow density. Here, F (t) represents cumulative freezing temperatures, a concept similar to positive degree days in Eq. (4.4) but measuring the integrated temperature below 0°C. In (4.7), this has units °C • s, though freezing degree days (negative degree days) can be used instead, with a conversion in the units for thermal conductivity. Figure 4.3 plots the solution to Stefan's equation for an idealized scenario: a step temperature change to -10°c, maintained for 200 days. For comparison, the numerical solution is also shown here, as calculated from (4.4). An additional curve is added to indicate the additional impact of snow cover on ice growth, assuming a linearly increasing snowpack over the 200-day period of ice growth and a maximum snowpack thickness of 40 cm. Figure 4.3. Lake ice growth during 200 days based on the Stefan solution (dashed line) versus the numerical solution from Eq. (4.4) (solid line), for a step cooling to an air temperature of -10°C. Lake ice thickness is also plotted for a case with linearly increasing snow cover over the 200-day integration, to a maximum snow depth of 40 cm (dotted line). A snow density of 300 kg m-3 is assumed. for lake ice, a coefficient f (ranging from 0.2 to 0.8) has been added to the right-hand side of (4.7) to reduce the predicted ice depth in order to account empirically for the insulating effects of snow and other assumptions inherent in (4.7). Higher numbers apply in windy environments with little snow cover, whereas low values apply where snow cover is deep and subsurface heat fluxes are high (e.g., with warm underlying lake waters). This is essentially an extension of Stefan's equation, treating layers of ice and snow in series with respect to heat conduction. This approximation assumes linear temperature gradients in the ice and the snow, with an equal conductive heat flux through each medium such that dTJdz and 9Ts/9z have equilibrium values in inverse proportion to the thermal conductivities, ki and ks. 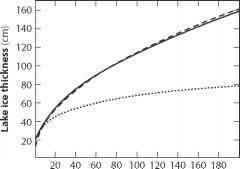 Equation (4.8) can be solved to give the incremental ice growth, SHi, over a time period St with negative degree days F(St) [where F(St ) = -fTadt]. It is also possible to add a third "resistor" to the denominator in (4.8), describing the effective heat transfer between the snow surface and the atmosphere. In fact, there is little need to rely on Stefan's equation or (4.8) nowadays, as a full numerical solution of one-dimensional heat diffusion in Eqs. (3.5) and (4.6) is straightforward. For instance, the computer program to generate the examples presented in chapters 3 and 4 took less than a day to develop. Data concerning snow depth and the surface energy balance terms (Eq. 3.1) are much more limiting in simulation of lake ice. The thermodynamics discussed above also apply to basal melting of lake and river ice, but heat fluxes from the water do not usually drive this process. Rather, ice breakup—the spring thaw—is driven by the intensification of solar radiation in the spring and early summer, supplemented by increased longwave and sensible heat supply as the air and the surrounding terrain warm. The surface energy balance equations of chapter 3 are salient here. Initial melting of freshwater ice proceeds slowly, accelerating in late stages due to the presence of low-albedo melt ponds and areas of open water. At higher latitudes, where the ice cover is thick, lake ice tends to persist longer into the spring than the regional snow cover. Late in the melt season, warm air advection from adjacent snow-free land thus provides an additional source of heat energy to accelerate ice breakup. It is common to find a layer of meltwater overlying lake ice that is still quite solid; the ice cover remains impermeable until late in the spring thaw. During advanced stages of ablation, internal melting from absorbed solar radiation transforms the ice surface to a pocked, lower-density medium that is colloquially referred to as "rotten" ice. Deteriorated surface ice of this nature can also be found on sea ice and glaciers in summer. Another feature that is often seen as lake ice decays is the development of candle ice, where columnar black ice is prevalent. When lake water freezes, impurities are rejected and collect at the interstitial grain boundaries. 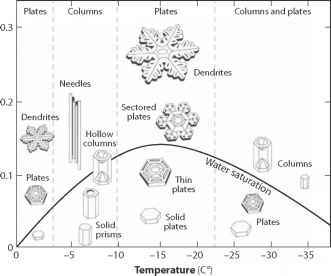 These impurities depress the freezing point at the junctions between vertically oriented ice crystals, and during initial stages of thaw these intercrystalline boundaries are the first regions to melt, isolating the columnar ice candles. Similar features can be seen in terrestrial icings that are formed from groundwater seepage through the winter.